After I became a bit more known, I got a phone call asking me to make a home visit to a Mrs. Schneerson. I set an appointment, but then I got busy and forgot to go. It was around 8:30 p.m. when the phone rang and the caller asked what had happened. That’s when I remembered the appointment and I apologized profusely, offering to come immediately, which is what I did. When I arrived at the address she gave – 1304 President Street – I was met by a German Shepherd guarding the yard, so I figured that this lady must be quite affluent. But when I went inside the house, I found it quite plainly appointed – considering the guard dog outside, I had been expecting a mansion. I met the nice elderly lady who had called me – this Mrs. Schneerson – took down her medical history and treated her. She was about 85 years old, but she still had very regal bearing. At the same time, she was very warm and kind and approachable. I recall that she also served me cake and tea, and then I left. The next morning in the office, I got a number of phone calls. Some of my other religious patients had somehow gotten wind of my visit – perhaps I was spotted as I was pulling up to the house – and were very excited that I had treated Mrs. Schneerson. I didn’t exactly get what the fuss was about until my secretary explained to me that I had treated Rebbetzin Schneerson, the wife of the Lubavitcher Rebbe. “Okay, I’ll think about it,” I told her, but really, I just forgot about it. Two months went by before I got a call to visit Mrs. Schneerson again, and I apologized to her for not knowing that she was the Rebbetzin. “If I knew who you were, I’d have put on a yarmulke for you,” I said. She again served me cake and tea after I treated her, and we had a very pleasant chat. After that, I saw her every two months, and we became quite friendly – in fact, so much so that some of our conversations over cake and tea began to broach personal topics. Once she inquired if I was married. I said that I was not but I wanted to be and was actively dating. “You are dating nice Jewish girls?” she asked. “No,” I answered, “I can’t stand them.” And I really meant that because the Jewish women I encountered were very materialistic and not to my liking. I preferred dating non-Jewish women. “If it’s meant to be, it will be,” I replied noncommittally. And from what people tell me that must have been a blessing concerning my future. “Thank you,” she said, and we left it at that. Whenever I think back to that exchange my eyes tear up – she would have made an amazing mother. But I guess, in some way, she really was an amazing mother to so many. Over time, I began to feel that she truly cared about me. Once she said to me, “Whenever you need help, doctor, I will help you.” And she did. There came a time when the father of a friend of mine was gravely ill, and I was asked to see what I could do to obtain the Rebbe’s blessing for recovery. Naturally, I called the Rebbetzin and she promised to speak with the Rebbe, assuring me, “Everything will be fine.” And it was – the father recovered. It was a very special moment because I sensed that she had gone out of her way to help me. That was the only time I asked her for help while she was alive. Then, ten years after she’d passed away, she helped me again. This was after I went to Israel and decided to become more religious. When I arrived at Ben Gurion Airport, I kissed the ground and pledged never to work on Saturday again. And then, when I returned home, I committed to finally getting married. I was forty-two, and it was time. 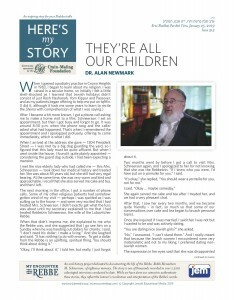 Dr. Alan Newmark lives with his family in Bays Water, New York, and maintains a private practice in podiatry in Crown Heights, where he was interviewed January of 2016.